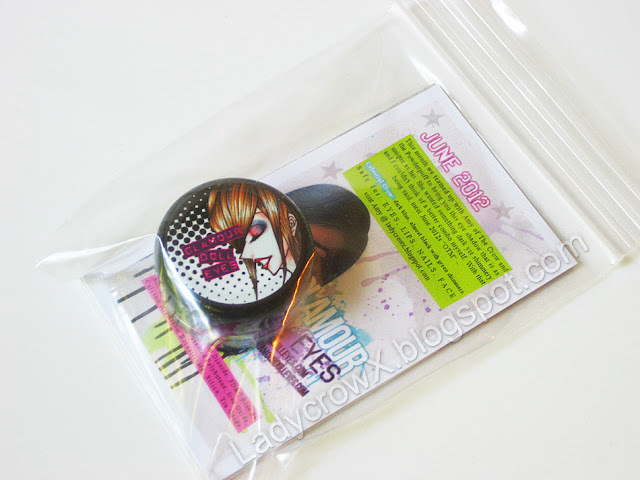 So Glamour Doll Eyes has this great monthly subscription called "Of the Month", I actually purchased the OTM right when it started back in Janurary, 2012. I didn't post about it before because of my busy schedule and the fact I wanted to try it out first. This months OTM is actually my 6th and last month of the subscription so I've been able to test it out to the fullest! 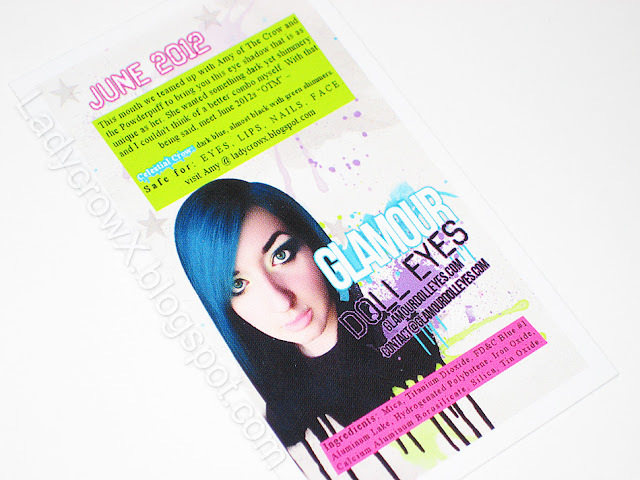 "Glamour Doll Eyes will be releasing a new color each month that we will call "Of The Month's". These products will be limited to just that month and will be sold for only that month. The item of the month may be an eye shadow, an eye light or maybe even a lip product. Whatever it may be, you can guarantee that it will be awesome!! You can choose just to get the item that month when it is listed, or opt to get a 3 month or 6 month subscription. Each month, the items will be released on the 15th. If you order a subscription, they will be mailed off sooner, so you will get first look at the new item. There will only be 100 of each color each month so picking up a subscription will guarantee that you will get the color the following months. Once all subscriptions are shipped for that month, the color will then be sold as an individual for whatever is left." I will have a full review and pictures of the full 6 months shortly as well! This month however I got the chance to actually help in the creation of the OTM by actually throwing my idea out to Vee (the owner of Glamour Doll Eyes) on a color as well as name I'd like made. I had a couple ideas on what I might like to see created but ultimately I'm all about blues and crows. When thinking about the color I wanted something to do with a crow, I thought about the color of a crows feather and how it has a shift of green to the black as well. I felt so lucky to be involved in this months OTM and I'm so thank you to Vee for giving me the chance to inspire this shadow! This picture does not do the shadow justice! Normally with the OTM's if you didn't sign up for the subscription (there are 100 available) any extra would be for sale on the website on the 15th of each month. For the month of June however I was notified the shadow was sold out before that date. 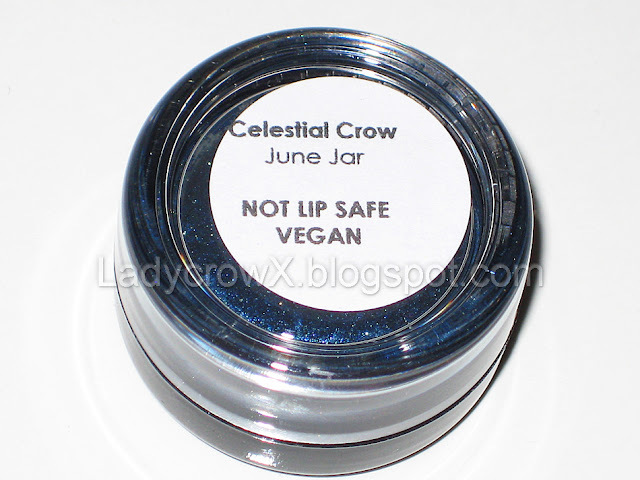 So in turn this shadow will not be for sale on the website this month, fear not though I will still be having a giveaway for a jar or two of this to my followers (provided to me by the wonderful Vee!). OTM's are available again to start in July so hurry over and get yours before they are sold out! There are options for either 3 month or 6 month subscriptions. I purchased my next subscription option of 6 months because I love the OTM program! Camera phone pic to show sparkles! wow! This shadow looks absolutely gorgeous! GDE was my first indie brand, I still have the original colors I bought. I still really like Bruised! I've never hear about this brand because i'm spanish, so those brands are not known in our country. I love this one, it's so bad that they are sold out, I want it so badly, amazing color. Congrats! I have been wanting to try that company. Celestial Crow looks devine. To all gods in heaven, please let me win. 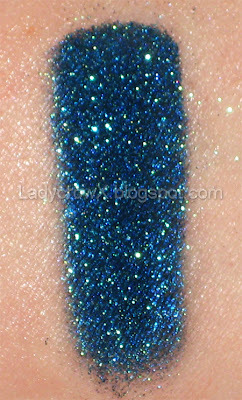 This looks like the rarest, most epic eyeshadow ever! My favourite used to be Mingles (? ), which is a matte, bright navy. It's hard to work with, but the colour is unbeatable. I've never tried any of their products before, but I'm going to their site as soon as I'm done here. I would love to try Celestial Crow, its insanely gorgeous! This color needs to be in my life! holy crap!! This is BEAUTIFUL! My one question..it says that it is NOT lip safe on the bottom of the jar, yet the insert with your pic on it says it is. I'm assuming it isn't and they made a typo? I really wish GDE would consider making that color part of the permanent line. So gorgeous. Hard to pick a favorite GDE color, but ONE of my faves is jailhouse jumpsuit. I have the circus collection and love all the colours. I love all my GDE but am totally bummed I missed out on this one. 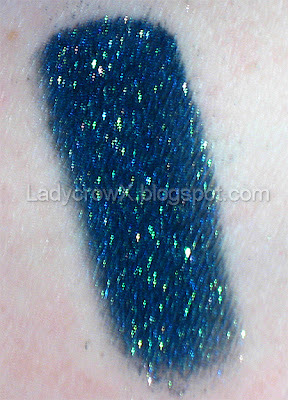 This has to be the prettiest shadow and I wish I had it in my collection! My favorite GDE as of right now is Her Revenge. I love reds and it's GORGEOUS. Absolutely gorgeous. I'd only hope it come out that way for me! I must be blind. I can't find the link for GFC. I clicked follow for blog & for google +1 but those weren't it. I really love Dirty Jeans! I want to try Candy Floss! My fav is Fiji Mermaid! This looks amazing together. I would have to say that my absolute fav color by GDE is Tattooed! It's such a bright purple, I can't get enough of it!!! I love Tattoed , purple is my favor shadow color but usually is very difficult to accomplish without looking bruised! Your color looks absolutely stunning! My favorite color would have to Satan's Sheets, I wish it was permanent. I would love to try Fiji Mermaid! Thankyou so much for the giveaway! Good luck everyone *fingers crossed*. I would love to try 2 looks, Candy Floss and Angel Wings. I think they are both so beautiful and would give me totally different looks. 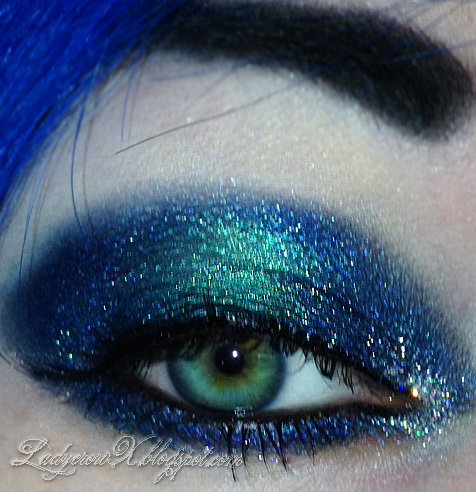 But to be honest I should probably go for a blue ish colour because these always make my eyes really stand out. So, maybe blueberry lush :). That's a lovely colour and I think it would make my light blue eyes really pop out. Eeee, it's so hard to pick just one :p.
I love GDE, my fave combinations are Jailhouse Jumpsuit/Strawberry Shortcake/Phyrra/Glam Girl/Tattooed.. Or Shamrock/Island Chic/Blueberry Lush/Tattooed. I love how blendable they are, makes rainbow gradient looks a breeze! Love GDE! My favorite color is Aquafoil. OMG!!! It's the most gourgeous GDE shadown ever!!!! They must put it in the permanent collection!!! I have never tried GDE but Celestial Crow would be a great introduction. I am always drawn to these type of colors. Thanks for the looks and tutorial. 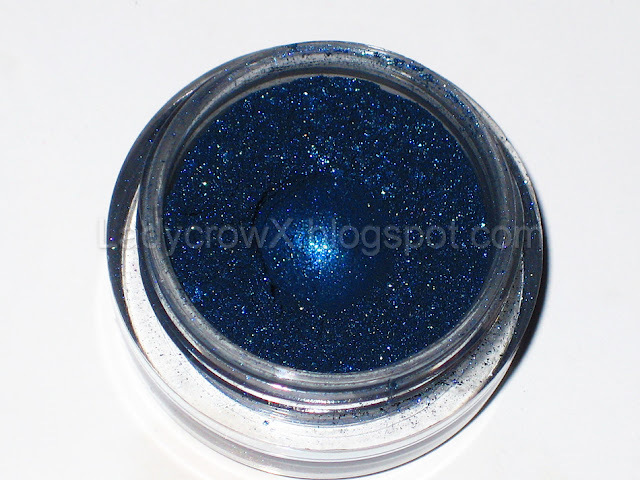 I have a few GDE shadows and a huge wish list but I NEED to try Celestial Crow!! It's gorgeous! I don't have any GDE yet, but I'm always really excited about them, when I see the swatches. I haven't tried any of their shadows yet but have wanted to for a long time, and even more-so after seeing this shadow!! So gorgeous! What a gorgeous shade. 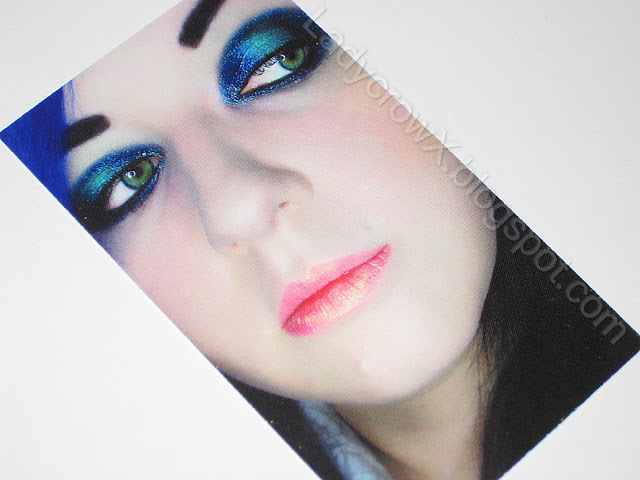 I've never tried any of the GDE shadows, but I'd love to try Island Chic, Bruised, or Veteran! This is very beautiful shadow, never tride GDE before but its gorgeous!! 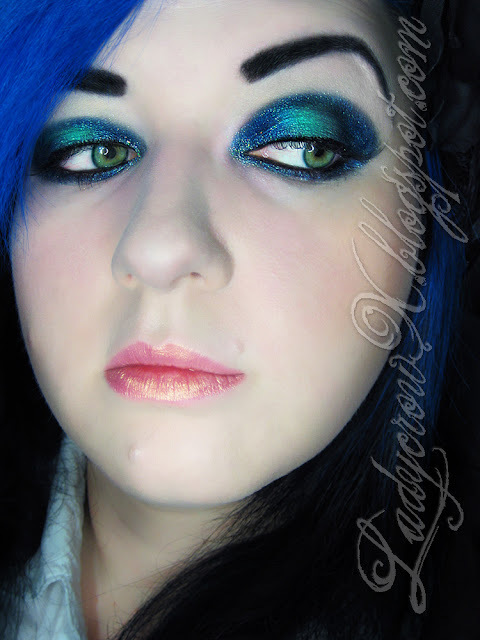 Just watched a few videos from your youtube channel, absolutley gorgeous tutorials. i never tried any.. but i really wanna try.. thanks for the giveaway! i havent tried any. but i want an adventurous look.. hehe.. thanks for the giveaway anyway! i havent tried any.. but i really wanna try this celestial glow! omg that shade is beautiful :) i hope i win! Celestial crow look awesome. If it'a anything like Evil Shades Glooming I'd love it. I'm interested in trying Glamour Doll Eye eyeshadows! They're beautiful! I would love to try Celestial Crow. This color needs to be permanent. I love island chic. It is so bright and beautiful. I've never tried any, but I REALLY want to try this color!